Worried about taking the required German Orientation test “Leben in Deutschland“? Don’t be. With Leben in DE, you’ll pass easily, even if your German language skills aren’t the best. 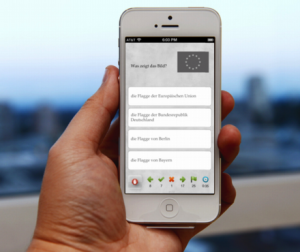 Leben in DE lets you prepare for the test whenever you have your iOS device and a few extra minutes. Leben in DE keeps track of your progress, making sure you master all the questions with the least amount of effort. Leben in DE turns a repetitive, dull studying chore into an easy game. The questions and pictures are exactly the same as the official, government test. Ad free and full featured, Leben in DE comes with 50 of the 300 possible questions. The remaining 250 questions are available as an in-app purchase. Since the official government test must be taken in German, the questions are also in German, so you can learn them properly.